The Range Rover bounced through the trees like the Indiana Jones ride at Disneyland, then, mercifully, stopped. Our guide shut off the engine. I could hear the ticking of hot stressed metal. My body was just as stressed. I may have developed a tick. I could see him, hiding, a giant bull elephant, trying, it seemed to me, to be inconspicuous. I began taking photographs. Through the lens, the elephant looked annoyed. With crunching footsteps, he lumbered out of the trees into the open, staring at us. We stared back at him. He came closer. Closer. CLOSER. I reached for a wider lens. Hold very still, our guide whispered. He reached for his rifle. The giant elephant stopped, three feet away. I could hear him panting. Snorting. I could SMELL him. VERY BAD BREATH. From my open seat in the Range Rover, he was massive. His tusks were stained red near the sharpened points. He looked down at me with huge, tired eyes. He sniffed, his snake-like trunk sampling the air around me. His giant eyes blinked. I could see myself reflected in their rich, deep brown. He looked…sad, maybe. Resignedly tolerant, perhaps. Proud, certainly. I realized that the pounding I could hear was my heart, not his footsteps. Our guide put down his gun and started the Range Rover. The roar of the engine shattered the quiet surrounding us and we moved on. A thirsty African elephant takes a healthy drink from his own personal well. The world is a big, beautiful place, filled with interesting people, amazing sights, random coincidences and occasional tender mercies. I have been blessed to travel. I have been blessed to make friends on every continent. I hope to keep the friends I have made and make more as time goes by. However, my greatest blessings are found at home, with a warm fire, a good meal and my family, who love me. I hope you enjoy the photographs. Happy New Year. Soweto Towers could be one of the coolest places in the world to bungee and base jump. Corregated metal, cardboard, canvas and the ever-present barbed wire makeup the materials of most houses in the township. Without education, children growing up in the township face limited opportunities. A child can find pure joy amidst the most challenging of circumstances. Working with root fibers in Yamoransah village, Ghana. Jacaranda trees bloom in spectacular beauty on a residential street in Johannesburg, South Africa. Leopard finishing a meal of Impala at the Mala Mala Game Reserve, South Africa. One of the greatest achievements of Roman Engineering and Architecture, the Roman Colosseum is still the largest amphitheater in the world. Kneeling in the attitude of penitent prayer, this woman remains still for hours, hoping her prayers will be answered with coins in her cup. Late afternoon light illuminates a common staircase adjacent to the Scala Sancta (Holy Steps) said to be the steps Jesus stood upon before Pontius Pilate. KIngs and Courtiers still bask in the lavish extravagance of the Château de Versailles. Evergreen soldiers await the command to march on the Palace. One of the islands on the Seine, near the birthplace of Paris. Can you say Da Vinci Code? Scones and Smiles, she’ll warm your heart with both. Shape, pattern, line and light emerge through a high-dynamic-range look into the meadow. Early morning sun shines on Lone Peak, Wasatch Mountains, Utah. Temple Square in Salt Lake City is the headquarters of The Church of Jesus Christ of Latter-day Saints. Construction of the Salt Lake Temple began in 1847 and took nearly 40 years to complete. The Temple, surrounded by thousands of twinkling Christmas lights, stands as a symbol of faith and hope to more than 15 million Latter-day Saints (Mormons) across the world. Standing near a watering hole, this African Elephant felt the need to make other arrangements. 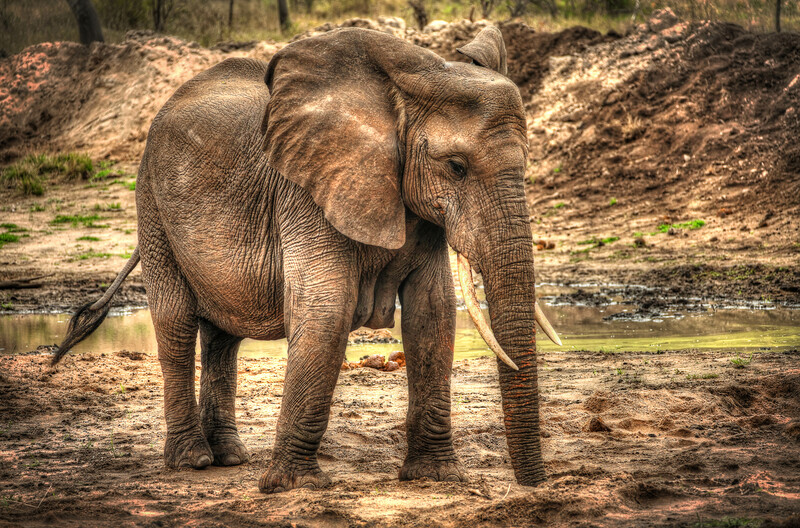 He dug a hole with his trunk until he struck water. Then, he drank to his heart’s content.